Classic round bottom router bits are commonly used for decorative designs for detailing cabinet doors. 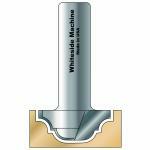 These Whiteside bits are the perfect woodworking tool to embellish solid wood surfaces. Choose from the available shanks and diameters below to add new Whiteside classic round bottom router bits to your collection of woodworking tools today. Click product name below for detailed product page. 1/8" 1/2" 5/8" 2" 1/4"
1/8" 1/2" 3/4" 2" 1/4"
1/8" 1/2" 7/8" 2" 1/4"
3/16" 1/2" 7/8" 2-1/8" 1/2"
3/16" 1/2" 1-1/8" 2-1/8" 1/2"
7/32" 9/16" 1-3/8" 2-1/2" 1/2"